In writing of the arrival of the Swing era inspired by such orchestras as those of Duke. Ellington, Fletcher Henderson and the Casa Loma, I made special reference to the latter, but it is obvious that, for the record, something should be written in at this stage about the first two, especially as only that of the Duke has actually visited Britain. It was in 1933 that we in Britain first heard and saw the Ellington Orchestra in the flesh although we were already familiar with many af its earlier recordings and had seen it in, I think, at least one film. It would be no exaggeration to claim that, despite earlier visits to Britain of other fairly large and stylish American orchestras such as those of Isham Janes, Vincent Lopez, Ben Bernie, Hal Kemp and Paul Whiteman, it was the Duke's ensemble that really won British musicians for Swing, or big band jazz. The Ellington Orchestra was, of course, in a category all of its own due largely to the special talents of its leader and the rapport that existed between him and every one of its individual members. In the early thirties, with its own repertoire, composed mainly by the Duke for his specific personnel, and with its clear- cut instrumental combination of five brass four saxophones and four rhythm, the orchestra had an enormous appeal for players and music writers alike At that time the personnel consisted of Art Whetsol, Freddy Jenkins and Charles "Cootie" Williams (trumpets), Lawrence Brown, Juan Tizol and "Tricky" Sam Nanton trombones), Johnny Hodges, Otto Hardwicke, Harry Carney and Barney Bigard (saxophones), Sonny Greer, Wellman Braud, Fred Guy and the Duke (rhythm). One who was deeply inspired by Ellington was Patrick "Spike" Hughes, a musician and journalist of Irish stock, who had first arrived on the London music scene around the winter of 1929/ 30 with his Cambridge Nightwatchmen at the Cafe De Paris. He played a stringed bass, made of aluminium instead of wood. Among the personnel were Buddy Featherstonhaugh, who quickly achieved considerable success as a tenor saxophonist and later as a bandleader, and Pat O'Malley, who was the drummer/ vocalist. 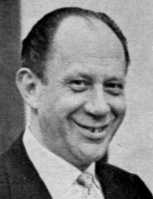 He later joined Jack Hylton's orchestra as vocalist and ultimately settled in America where he has long been a distinguished television character actor, listed in the credits as J. Patrick O’Malley. Hughes, who incidentally also worked with Hylton for a brief period and was a journalist of considerable talent (which was soon to become his profession), concentrated his activities during the period 1930 to 1933 in the fields of music writing, as both composer and arranger, recording and, of course, journalism. So far as I can recall his first records were made by Decca in 1930, and on some labels the band was described as "His Orchestra" whilst on others it was described as "His Decca Dents". Like many other musicians of the period, Hughes was an enthusiast for the Red Nichols/ Miff Mole recording groups, and so it was not surprising that his earliest sides were in the style featured by them. Among Hughes' personnel were musicians like Norman Payne and Jock Fleming on trumpet and trombone respectively, the former, fresh from his experiences with the Elizalde band, playing in great style. On saxophones were Harry Hines, many years later to build a highly successful comedy personality as "Dr. Crock", Philip Buchel, a Jimmy Dorsey devotee, and Buddy Featherstonhaugh, who, of course, had been with the Cambridge Nightwatchmen. Eddie Carroll was the pianist, Alan Ferguson the guitarist, Bill Harty, then borrowed from Sid Bright's Orchestra at the Piccadilly Hotel, was the drummer, whilst Hughes himself completed the rhythm section on what he usually described as his "tin" bass. On some sides there was also an excellent string section consisting of George Hurley and Ben Frankel, both from the Elizalde band and Stanley Andrews. But, good as they were, the general style of the band seemed hardly to call for violins, except perhaps to play the odd jazz solo. Buchel, who played alto saxophone only, was one of those interesting musicians who did not read the "dots" but who could quite comfortably sit in with those who did. He was also a first- class tap dancer and, in my recollection, appeared in at least one West End musical as a featured soloist in both his techniques. At some point in the mid thirties I remember deputising with his trio at the old Bag O' Nails Club in London's Kingley Street, when his nightly repertoire included Jimmy Dorsey originals like "Oodles Of Noodles" and "Beebe". The pianist was Harold Hood who later joined Nat Gonella's Georgians, a small jazz group which enjoyed considerable success between 1935 and 1939— a period to which we shall be coming later. One recording session organised by Hughes in 1930 resulted from the second visit to the famous Kit Kat Club of none other than Ted Lewis and his Band, which had previously played there in 1925. The jazz critics usually slammed Lewis's presentation, his personal contribution to which was musically corny and vocally hammy and, of course, when backing his monologue- type vocals, the band had very little opportunity to shine. However, when given the opportunity in numbers like "San", "St. Louis Blues", "Tishomingo Blues" and the inevitable "Tiger Rag", I recollect that they made a really healthy jazz sound. This was hardly surprising for, although himself no great jazz musician, Lewis knew what it was all about and among his line- up, which for years consisted of two trumpets, two trombones, two violins, baritone saxophone/ clarinet and four rhythm, were to be found such players as Muggsy Spanier and George Brunies, on trumpet and trombone respectively, and Don Murray on reeds In 1930, however, for the Kit Kat Club season, the baritone saxophone and clarinet chair was held by Jimmy Dorsey. Decca were persuaded to set up a session for Dorsey supported by a quartet described as "Spike Hughes and his Three Blind Mice", which consisted of Hughes, Bill Harty, Alan Ferguson and, so some critics thought at the time, Eddie Carroll. It transpired, however, that the pianist was in fact Claud Ivy, a fine musician, who had been a member of the Hylton orchestra from its earliest years. Four sides were cut, two of which were "After You've Gone" and "I'm Just Wild About Harry", the 78 r. p. m. disc of whiah is still in my collection, the others being "Tiger Rag" and "St. Louis Blues" Dorsey was a great stylist with a facile technique, but in "Harry" he was, in my opinion, guilty of sheer exhibitionism for its own sake, because he played, at a tempo of some sixty bars a minute, a chorus on alto in which there were twelve quavers in each of the first twenty- eight bars out of a total of thirty- six All very clever, of course, but nothing to do with jazz— sounding as it did more like one of the old Rudy Wiedoeft novelty type solos for alto or C melody saxophone! Dorsey nevertheless redeemed himself in the next two choruses, the first of which was on clarinet following a piano bridge and the second back on alto following a drum break, and the session as a whole served to stimulate considerable interest among musicians at the time.